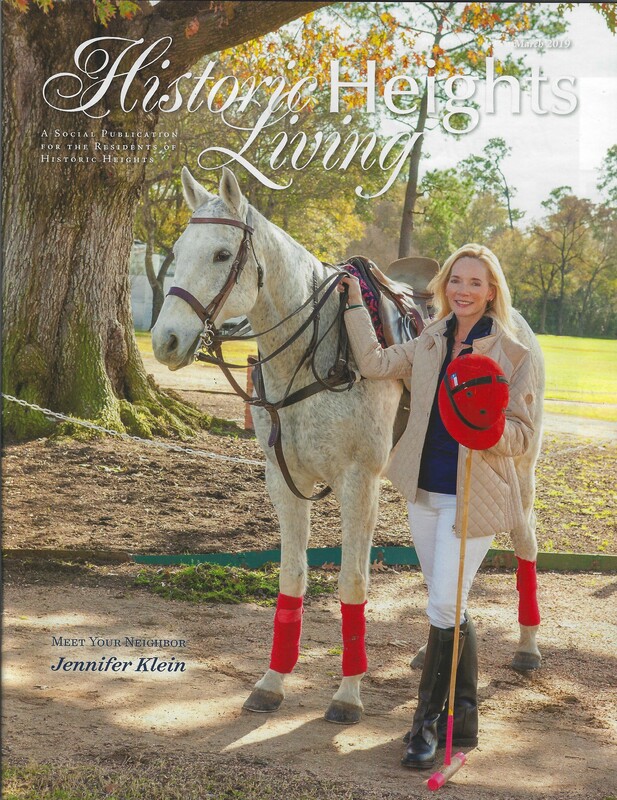 Have you seen Jennifer on the recent cover of the Historic Heights and Living magazine? Historic Heights and Living chose Jennifer for their cover with a 2 page article inside about Jennifer Klein Physical Therapy and AATB Pilates. The horse pictured, Soldier belongs to Barley Flanders. Flanders Field at the Houston Polo Club is named after Barley. She remains an integral part of the club. Spring season starts on April 11th! On 3/31/19 The Houston Polo Club hosted the 2019 Legation Cup Final between Texas and Great Britain. The Honorable Charles Cadogan was the first to score, successfully converting 2 open goal penalties to give Great Britain a 2 goal lead going into halftime. The crowd walked the field at halftime, enjoying complementary champagne, stomping divots, and looking over the Ford Trucks from Bill Fick Ford, Land Rovers Land Rover Houston Central, and Porches from Porsche of West Houston that were on display. After the half-time festivities came to a close, the teams were back on the field, and the crowd watched in anticipation for what the second half would bring. Bryan Middleton from team Texas, came out firing the third chukker, scoring three unanswered goals on the Best Playing Pony of the match, a chestnut mare named Max. The crowd cheered the Texas team on, as the fourth and final chukker began. Texas players Billy Mudra and Paul Hobby put a goal each on the board to extend their lead to 5 to 2 in the middle of the last chukker. However team Great Britain was not ready to throw in the towel just yet. Honorable Charles Cadogan converted a safety and Will Emerson found the goal from the field to bring their team within 1. The English had 30 seconds to tie the game from a knock in, but their play was interrupted by the Texas’ team solid defense effort and the clock ran out with Texas coming away with a 5 to 4 win over Great Britain. 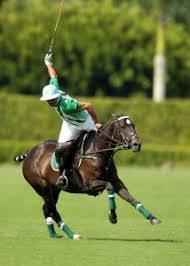 How do Polo Injuries Occur? 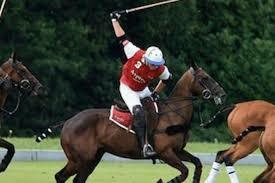 Polo is a sport that requires a delicate coordination between the riders, horses, and swinging mallets. Stabilizing oneself atop the horse during sudden stops-and-starts from galloping, sudden changes in direction, and twisting and leaning down to swing the mallet places a great deal of stress on soft tissues like muscles, ligaments, and tendons. While competitive and recreational polo rely significantly upon core and lower extremity strength and endurance, the right shoulder and spine are under substantial physical demand as well. It is important to realize that the whole body is at risk for overuse injuries. Each time a rider grips his/her saddle or flexes their leg to rise up and down in the saddle, the adductor muscles around the hip and their associated tendons are being used. They are particularly prone to injuries from the repetitive stress of polo play, especially if any existing muscle fatigue, weakness, or imbalances already exist. The repetitive stress causes the adductors to become abnormally stretched or torn, resulting in a groin strain. The quadriceps, sartorius, and other muscles in the thigh area are also engaged, serving not only to grip the saddle, but also to flex and extend the leg allowing the rider to rise up and down as the horse is trotting. Shoulder tendinitis is when the rotator cuff tendons become irritated and inflamed. Shoulder bursitis is when the subacromial bursa becomes irritated and inflamed. In either case, repetitive shoulder movements, such as from raising the arm to swing a polo mallet, or a mild direct hit to the shoulder can irritate the tendons and bursa and cause them to become swollen. As the swelling continues, the space between the acromion and humeral head becomes more narrow and can squeeze the rotator cuff, resulting in rotator cuff impingement. Due to the constant demand on riders’ legs, strong and elastic muscles in the lower extremity are critical. Riders rely considerably on their calves to stabilize themselves and to provide directions that prompt the horse to turn or speed up by applying pressure. These calf muscles are vulnerable to overuse injuries, especially when riders ride with their heels down, and may cause the knee and quadriceps to compensate. The resulting muscle imbalance may lead to shin splints, causing pain, inflammation, and muscle weakness. How Jennifer Klein Physical Therapy Can Help? In all of the aforementioned of the injuries, physical therapy can help strengthen and rehabilitate muscles, improve mobility, decrease pain, and restore function, having you back on your horse at full capacity. Where do muscle imbalances come from? They commonly occur in sports or jobs that require repetition of the same form or techniques. The antagonist muscle becomes tight and short, while the agonist muscle simultaneously becomes overstretched and elongated or vice versa. There is an increased chance of injury and early fatigue if muscle imbalances go unaddressed. Besides stretching and strengthening, modalities often play a part such as cupping and needling and electrical stimulation. It is important to stretch the muscles that are strong and under high demand of eccentric concentration contraction. The muscles that are constantly under high concentric demand include: the quadriceps, hamstrings, IT band, hip abductors, hip external rotators, and the core and abdominal muscles. It is also necessary to strengthen the muscles that are flexible and under high demand of eccentric contraction. These muscles include: the shoulder external rotators and the pectoralis major and minor.